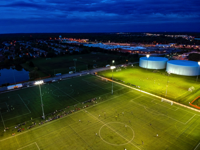 Our facilities are some of the best fields in the Northwest suburbs of Chicago. Our main home is Celtic Park, boasting two lighted 11v11 turf fields plus another lighted grass field. An additional 11v11 grass field is across the parking lot as well as 2 small-sided fields. Celtic's other large complex, Ron Gbur Park (formerly Hamilton Park) has six 11v11 field with 4 fields with lights. The Palatine Park District maintains our fields and they are some of the best in the business when it comes to getting them ready each season.